Mi Casa es tu Casa ! | La Rosilla - Lifestyle and food. 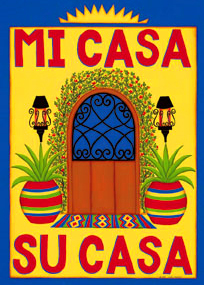 ‘Mi Casa es Tu Casa’ event. I decorated the room with the most fragrant Mimosa, picked from the mountain, like luminous plumes of the most exotic bird, Place settings were garnished with Lavender, and Almond Blossom adorned the table, the air was perfumed with the natural aromas, of a Spanish Spring. The entrance was lit by flickering candle light, leading the way to a night of revelry and indulgence. The roaring fire, created the glow and warmth for a wonderful welcome. 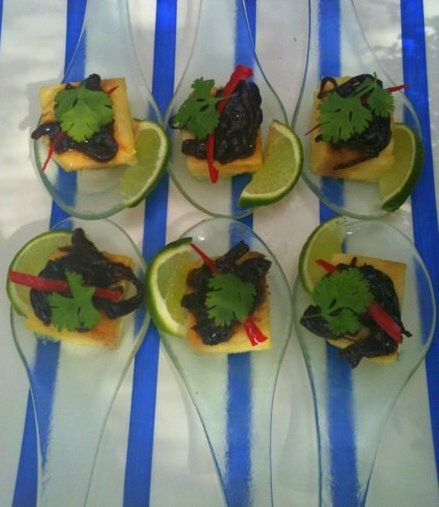 A menu of comforting dishes was served, after canapés of Spiced Roasted red pepper dip ,and Thai Galloping Horses were enjoyed with chilled Bollinger champagne. The finest Spanish Wines were quaffed, deep ruby reds of Ribera del Duero & Rioja, and White Albariño from Rías Baixas the colour of honey. After deserts of “To die for bannoffi pudding “and “Vegan Chocolate Orange cake” Cheeses of every style, along with figs, apricots, passion fruits, walnuts and cape gooseberries, were presented to groans of “I can’t possibly eat anymore” but were eaten with delight, whilst sipping the obligatory port passed from the left. A night of merriment and memories was had by all, and dreams of more wonderful La Rosilla evenings to come. A refreshing and piquant canapé , that looks impressive to be served with Pre-dinner drinks. heat until thick and glossy, then leave to cool. Cut a fresh pineapple into dice of about 1 inch, and top with a tsp of the cooled onion mixture. top with a sliver of red chilli, a coriander leaf and a squeeze of lime.